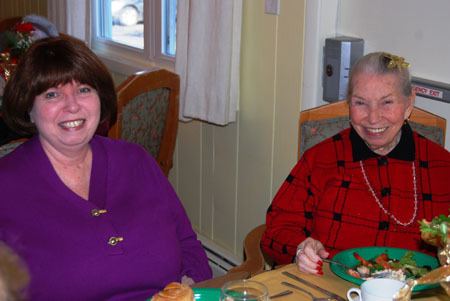 Georgia Kuntz (left), of Nesconset, cheerfully spends quality time with her mother, Madeline Pedota (right), at McPeak's Assisted Living's Annual Holiday Party. On December 13, residents and their family members commemorated the holiday season by attending McPeak's Annual Christmas Party, which took place in the establishment's dining area. Families and residents enjoyed a fresh, delicious lunch that included a variety of traditional holiday dishes. While families reunited and indulged in their meals, Santa arrived with presents for each resident. Endearing smiles and contagious laughs filled the room as Santa Claus greeted every family at a different table. In addition, live musical entertainment was provided for all to enjoy. Many Christmas tunes were played to get residents and their families in the holiday spirit.